Babolat Pure Strike is said to be the most forgiving in the Pure Strike racquet line. It is very easy and quick to use right out of the box. It will allow you to perform strike shots from the baseline smoothly and effortlessly. However, it may have some stability issues, especially if you hit it outside the sweetspot. So, how does it compare to the Tour version? Babolat Pure Strike Tour is significantly heavier, and is famous for the solid and stable feel. 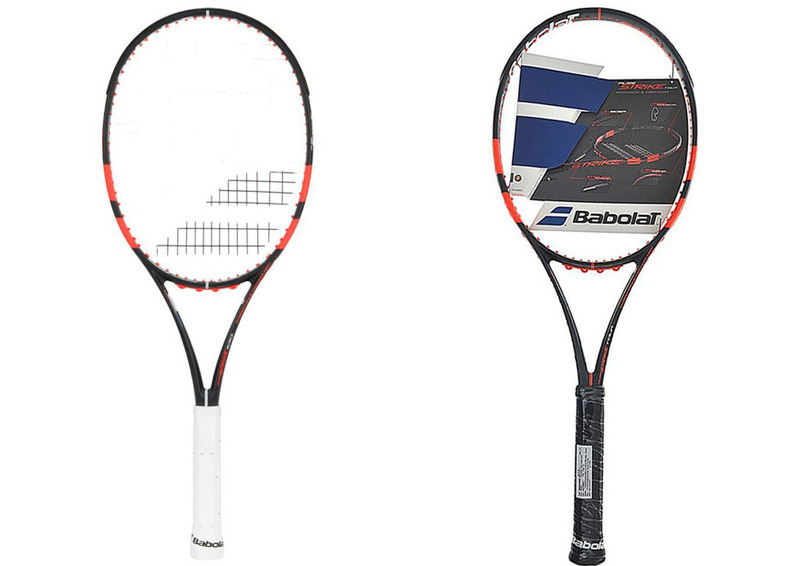 Continue reading the comparisons between Babolat Pure Strike vs Tour below. Babolat Pure Strike 100 is quite a beginner-friendly racquet because it comes with a wide head. It has a head size of 100 square inches, hence the name. In addition, beginners usually prefer a lighter racquet, and Babolat Pure Strike 100 perfectly matches the requirement by weighting just 10.8 oz. The string pattern has 16 mains and 19 crosses, promising some flexibility and depth. On the other hand, Babolat Pure Strike Tour has a smaller head size which is 98 square inches. It is heavier at 12 oz, though it is not as heavy as Babolat Pure Aero vs Tour. The swing weight is significantly higher, which is the major reason why this racquet may not be suitable for all players. The string pattern has 18 mains and 20 crosses, so it will be slightly stiffer and more consistent. Serving with Babolat Pure Strike 100 is not bad at all. It is stiff enough in the right spot, and it is super easy to swing. It is lightweight and fast. It will be very nice when you are feeling tired, as the swing weight is very low. However, due to the lightweight nature, this racquet tends to lack power. It can be inconsistent too at times. Once again, maneuverability becomes Babolat Pure Strike 100’s biggest advantage when it comes to returns. It is easy to swing, allowing you to be confident and aggressive with your returns. It is a great choice if you need some extra pace. However, hitting outside the sweetspot will greatly diminish the comfort and stability. Babolat Pure Strike Tour, on the other hand, has the perfect balance of pace, power, and stability. You can still get some pace with this racquet, and the added mass helps to produce big and heavy serves. The contact feel is nice and solid. However, Babolat Pure Strike Tour tends to force you to use short and compact swings on returns. The heavy weight adds stability, but it also creates a challenge for a big swing. On the good side, it delivers excellent results on those short, compact swings. It brings great power, pace, and feel. - Because he uses every centimenter of the court to move his opponent and create open angles to win points,the first striker is looking for prescision. - Players looking for power and spin will find the right racquet thanks to a 16x19 stringing pattern. In general, Babolat Pure Strike Tour is more recommended. It has some added weight which greatly improves the power, stability, and feel. However, it tends to make you use short and compact swings due to the weight. Babolat Pure Strike 100 is a viable alternative if you prefer a lightweight racquet with high pace and maneuverability, but the power and feel aren’t as great.